Disney always knows how to make everything fun. The Disney Cruise Line does pirate night which I think is a totally awesome idea. 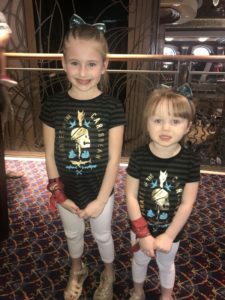 This past April was our very first Disney Cruise.The whole idea of doing a pirate night while you are sailing on a cruise ship is great. Even if you’re not into the whole pirate thing or have little girls, it’s a fun time. I have two young girls and they were totally into it. Since this was our first Disney Cruise we had never experienced any of this before. Some friends of mine who have done pirate night on the cruise told me you can get totally dressed up like a pirate or dress low-key. You cannot go wrong no matter how you decide to dress that night. Since my girls had never done it before, I did not want to overwhelm them and totally go all out pirate crazy. However we did book a second Disney cruise for next year and I am totally going all out! My daughter who is seven, absolutely loved it and said next year she wants to be dressed as a pirate. My youngest is three and she was into it but did not totally. She was happy and content wearing her sparkly bow and Pirates of the Caribbean T-shirt. Some people had full-out pirate Halloween-like costumes and pirate make up. Some people were just low-key with some type of pirate shirt or pirate T-shirt which totally works out fine. My family chose to go low-key especially that it was our first time for this. During the day when your state room is getting straightened up and cleaned they actually leave Mickey Mouse pirate bandannas on your bed for everyone in your state room. 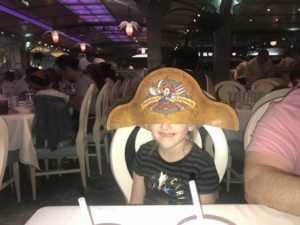 At night when you are at dinner they also give the children a Mickey pirate paper hat which is a cute idea. Disney does two separate pirate parties is on the ship. We were on a three night cruise on the Disney Dream so our pirate night was our second night which was Saturday. At that point, we had sailed away from Nassau Bahamas and were on our way to Disney’s island Castaway Cay. This was cool because the entire pirate festivities were all taking place while you were sailing in the middle of the ocean. The two separate parties worked out perfect for my family. Around 7:30 at night they do a Mickey pirate party which is more geared towards children. 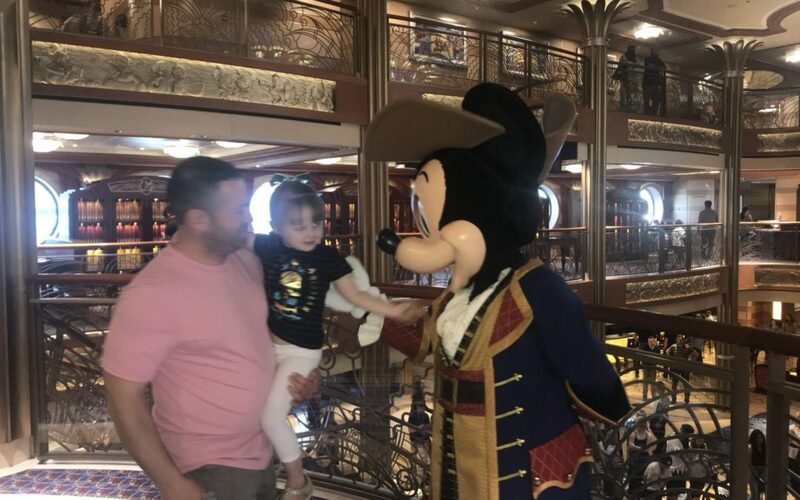 They have Mickey Mouse on the ship or you can wait on-line and take a picture with him in his pirate outfit along with Minnie Mouse who is located in a different location. We did our pictures with pirate Mickey first and then headed out to the Mickey Pirate Party. The pirate party takes place on deck where the pools are located. This was on deck 11. They actually have a floor that covers both pools so everybody can stand and sit and everyone can have a great time dancing. We chose to go and stand one deck above the party so that we were overlooking everything. 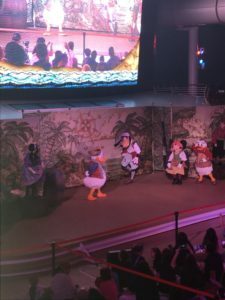 I figured my kids would have a much better view of the stage with the characters and be able to see the shell and have more room to dance around and enjoy themselves. The Mickey pirate party lasted about 45 minutes between the show and the music and I think that was a perfect amount of time. I think if it were any longer my kids may have probably lost interest. It was later at this point and my kids are usually in bed early. Once the pirate party ended we headed back to our state room got ready for bed and my kids went to sleep. Now around 10:30 PM they have the second pirate party. This pirate party includes a fireworks show which was not part of the kids party. We chose a state room with a balcony which worked out absolutely perfect. We were located mid ship on the seventh floor on the left side of the ship. Around 11:15 this gave my husband and I the absolute perfect view of the fireworks show at the end of the pirate party. The fireworks were done out at sea and my husband had I had a first row view of this awesome firework show in the middle of the ocean! 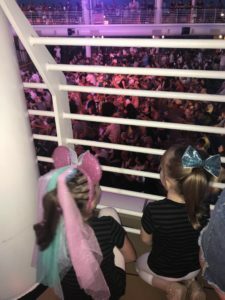 My recommendation to you is if you plan on doing a Disney cruise and cannot stay up with your children for the late pirate party try a balcony room. 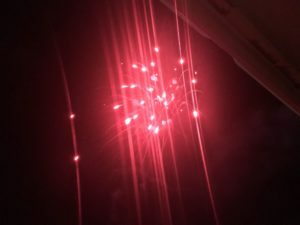 Once your kids are sleeping you can enjoy the fireworks show! 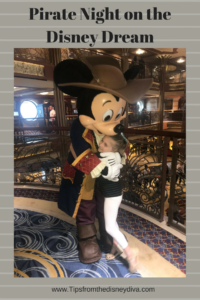 If you want to try a Disney Cruise, Patricia at All for Dreams Travel can help you with your planning needs! Become a Pirate at PIRATES LEAGUE! 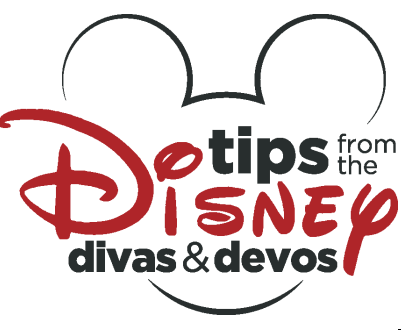 I’ve booked my dream Disney Cruise…now what? ?